A positive third quarter for financial markets has been closely followed by the return of uncertainty and concurrent less-than-positive market action. Through September 30, the broad US stock market rose over 7%—but following a divisive midterm election, continuing upward movement in interest rates and ongoing saber-rattling around global trade tariffs, the US stock markets (at this writing) have declined roughly 6% from those September 30 values. A strong US dollar has kept pressure on international stocks, but the silver lining is that foreign stock valuations are quite attractive, and many analysts are forecasting less dollar appreciation. Ten-year Treasury bonds have seen a pullback in yields since September 30, with rates hovering near 3%. However, since January 1—not surprisingly given the strong economic data—yields have moved consistently up from approximately 2.4%, meaning the broad bond market has faced a challenging 2018 to date. Overall, signs of economic strength continue. October jobs growth was a robust 250,000 and unemployment remains at a nearly 50-year low of 3.7%. GDP growth for the third quarter was a solid 3.5%. Given this continued economic momentum, at their September meeting the Federal Open Market Committee raised the key Fed Funds Target Rate by one-quarter of one percent point to 2.0% – 2.25%. Most analysts believe an additional hike in December to be in the cards, but signs of moderation in some indicators suggest the hikes may be nearing an end. Indeed, at this writing the Fed Chairman recently commented that he believes rates are “just below” their neutral target, which suggests there may be a pause or an end to the rising rate cycle soon. At 2.1%, core inflation remains mild and at the Fed target of 2%, which removes a significant impetus for further rate increases. Volatility and uncertainty have been a hallmark of the recent geopolitical and global economic environment. That seems unlikely to change. 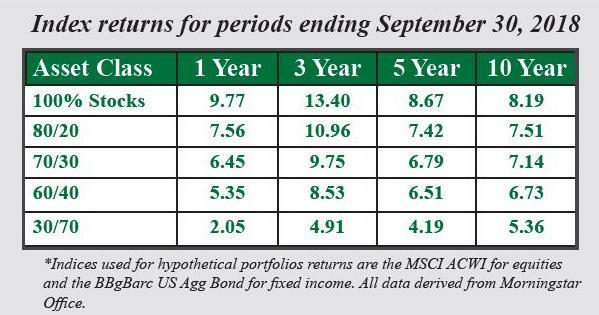 Yet in spite of the worries, high-quality investment portfolios remain a proven and prudent way to grow wealth in excess of inflation and to meet long-term goals. As always, please call us to address your questions, and make sure to apprise your advisor of any changes to your financial situation.